Details have begun to emerge of what could be Research in Motion's next generation Blackberry smartphone running the BBX operating system. According to an exclusive by The Verge, the reportedly named Blackberry London will be the first device to launch using the new OS. Internals are said to include a TI OMAP 1.5GHz dual core processor, 1GB RAM, 16GB of on-board storage, a 2-megapixel front facing camera, and a 8-megapixel camera on its rear. Most of the front bears a reported 3.7" touchscreen display, with no traditional keyboard in sight. Aesthetically the London is alleged to be thinner than the iPhone 4, with dimensions roughly similar to the Samsung Galaxy S2 Android smartphone. "The phone can be stood straight up on one of its sides (suggesting more boxiness than can be seen in the picture)," said Joshua Topolsky of The Verge. 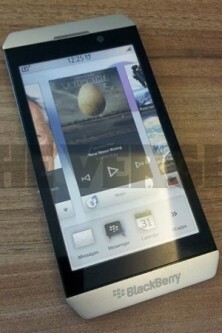 In many respects it actually looks a lot like the Nokia N8, with cues from the BlackBerry Porsche. The report caused some confusion considering the first rumoured BBX device was said to be named the Blackberry Colt. Another story by BGR appears to have dispelled any uncertainty, however. They confirmed the device was in fact real, according to a trusted source. "Our source told us that the BlackBerry Colt, the first QNX-based handset RIM had been working on that looked just like a smaller PlayBook, was scrapped in favor of the BlackBerry London." The new smartphone is pinned for a third quarter release in 2012, though that's far from solid given that two of RIM's most vital tools, BES and BBM, are reportedly non-functional with the new BBX software right now. Research in Motion is clearly hoping this new smartphone and the subsequent BBX devices that follow will bring around a change of fortunes for its phone business. Recent failures of its core services and the huge public outcry that followed have done little to help the current financial concerns they are experiencing.